Beets are filled with nutrients like boron, magnesium, manganese, folic acid, potassium and a wee bit of vitamin C. They are also high in fiber. But there is something else that resides in the pigment of this amazing vegetable. That vivid color that leaves its mark in your stools and urine is a very powerful antioxidant. It is called betacyanin. This compound has very strong anti-cancer effect. The freshest beets are the best tasting. Sweet like sugar. In fact, they are an excellent source of concentrated sugar. Cut off the greens as soon as the beets arrive in the kitchen. Otherwise, the leaves take moisture from the root, drying it out. You can store beets uncooked in the refrigerated for up to 21 days. Beets greens are excellent to sauté with olive oil. Add pepper flakes, some Nu-Salt (or regular salt) and right before serving, sprinkle with freshly grated Parmigiano-Reggiano (brand of Parmesan) cheese. The flavor will knock you over! 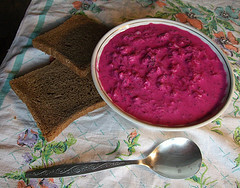 Beets are easily boiled, roasted, sautéed or steamed. Immediately peel this vegetable after cooking to keep the sweet juice from bleeding out. This prevents both loss of nutrients and beet fluids. In Hypertension. 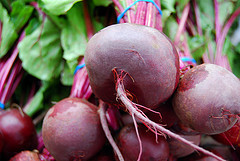 2008;51:617-619 , a study reported that beets decrease blood pressure. Resistance of blood vessel walls cause pressure to increase or decrease. When nitric acid is released by these blood vessel walls, blood volume expands and blood pressure goes down. This is called vasodilation (dilation of the blood vessel). Beets contain nitrates, which the body turns into nitric acid promoting reduced blood pressure throughout the circulatory system. If juicing daily, beets would be a great addition with celery to continually bring blood pressure down naturally. 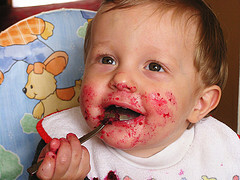 Beets may also be protective against liver injury. Studies show improvements in diabetic patients with blood glucose control. Diabetic’s ability to make or produce proper insulin may be impaired in the liver. Fatty deposits in the liver cells are prevalent in diabetics. The betacyanin in beets help limit this fatty deposition. This is also true in alcoholics and those with liver disease. We should all make beets at least a part of our weekly diet. As I kid, I remember getting served canned beets. Don’t ever remember going beyond the first bite. In college, I started to really appreciate that fresh beets were so delicious. We used them in salads and sometimes with cabbage julienne into colorful coleslaw. Beets are a healthy, sweet addition to any meal. Try them, nine times out of ten you going to thank me for pushing you to sample them again. This Kid Actually Likes It!